The tomatoes in the pots on my patio in Minneapolis are less than lovely, distorted with furrows and folds, marred by wind and scorched by the sun. But, when it comes to tomatoes, looks are deceiving. Tart, sweet, sharp, and bursting with flavor, these tomatoes conjure that perfect night in high school I tasted real, homegrown Jersey tomatoes. It was at dinner in my boyfriend Anthony's backyard, Union, New Jersey, a neighborhood not far from, but nothing like, my Short Hill's home. His mom, a heavy woman, in a long sleeved black dress and tie shoes, had just returned from "The Track"-- Monmouth, where she'd won a trifecta. "Bring in your girl," I'd heard her shout to Anthony, as we'd stopped at his house to pick something up. "We're celebrating." His dad, "the gardner", in sleeveless t-shirt, a cigarette held tight in his lips, set out platters of olives, fried peppers, pepperoni and salami, hunks of coarse bread, and a jug of red wine. Stretched out in a lawn chair, he told stories of his stint in the Army during WWII where he served as medic in Africa, treating soldiers in a tent of horror and gore. This was a rare night off for Anthony's parents who both worked at the family's Satellite Diner on Route 21. "I've never heard those stories before," Anthony told his dad. Well into midnight, we listened and ate up the last of the season's tomatoes under a full August moon. Anthony's dad's lopsided Jersey Girls were lush and weighty, musty with late summer sun. Just off the vine, they were sliced thick and plied with peppery olive oil, then sprinkled with coarse salt. "My granddad brought the seeds with him when he and my grandma moved here," Anthony said. My precious patio bounty is exotically named -- Green Zebra, Siungold, Marmande, Costoluto, Fiorentino -- they'd befuddle Anthony's dad. But in his honor, I slice and slather them with good oil and great salt, then I stretch out in a lawn chair with a glass of red wine, and polish them off under a ripe August moon. This time of year, make haste. Once the frost comes, close the door on your tomatoes, and wait for next summer to come. 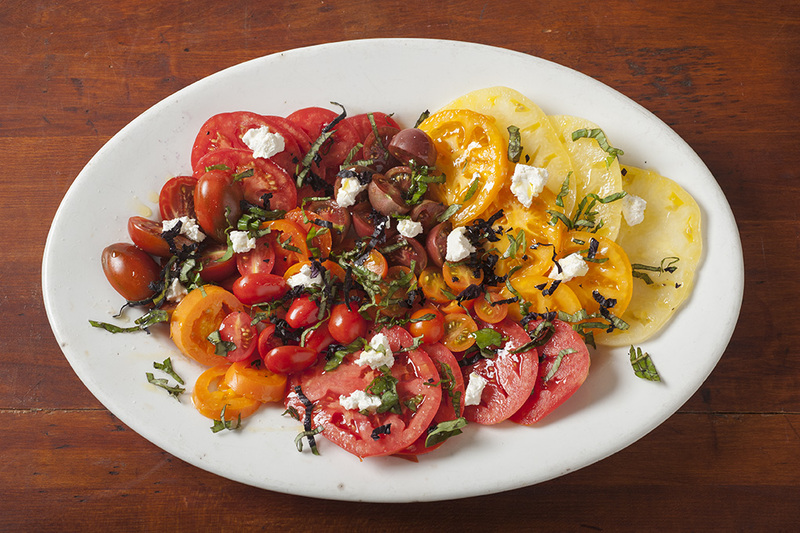 If you have any leftover sliced tomatoes, slow-roast them with herbs and serve over fresh mozzarella for a lively side dish or toss with pasta for an easy, light dinner. Preheat the oven to 325 degrees. Arrange the tomatoes in a small baking dish so they fit snugly. Drizzle with plenty of olive oil. Season with salt and pepper. Toss in the thyme. Bake the tomatoes for about 45 minutes to 1 hour, or until they are collapsing. To serve, arrange the mozzarella on individual plates or a single serving platter. Spoon the tomatoes on top and then sprinkle with the basil. This is good hot or at room temperature. I love your boyfriend's mother with her tie shoes and trifecta, as much as those tomatoes! Oh! she was wonderful! Every time she brought home a "win" she'd slip Anthony a $10.00 and say, "Here, take that nice girl out and get her something good to eat." Or, she'd insist we come in. What a terrific memory, Beth. I can almost taste the lopsided Jersey Girls!